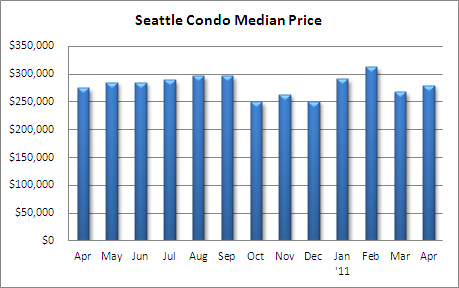 Despite negative reports from the news media Seattle’s condo market did all right in April. The median sales price improved, inventory levels held steady and unit sales volume activity was brisk. 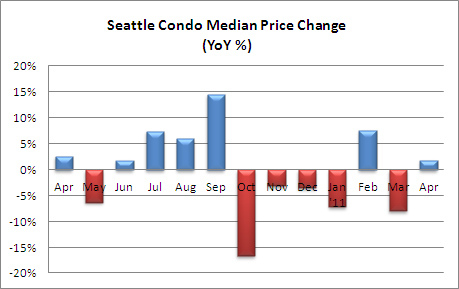 In April, Seattle’s median condo sales price rose 4.5% over the prior month and 1.82% year-over-year to $280,000, a slight reprieve from the lows of the past six months. Much is being made in the media about the sizable 37% year-over-year decrease in the number of pending sales that has reporters surmising the market is slowing and buyers are hesitating. I disagree. 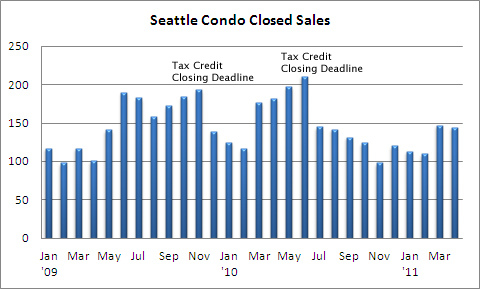 The sales volume recorded in April 2010 was anomalous, spiked by the tax credit deadline as noted in the chart below. Excluding the deadlines in 2009 and 2010, the sales volume in April was robust for the second consecutive month, especially without having the benefit of a tax credit to buoy purchases. 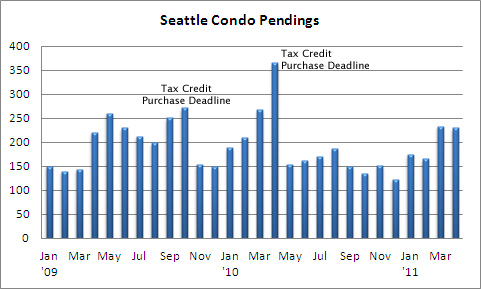 In fact, it was the second best month for Seattle condo sales since the tax credit expired. In some respect, it’s more of a market normalization compared to the tax credit euphoria last year. As expected, the number of closed sales declined 20.9% in April compared to the same period last year due the tax credit, yet remained on par with March. Although closings have lagged relative to the number of pendings, April’s closed sales volume was the third highest recorded over the past 10 months. 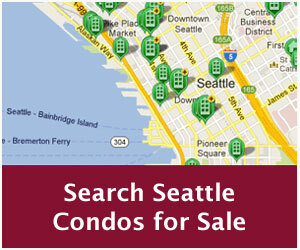 Seattle’s condo inventory has been holding steady. Normally, we would see a considerable increase in in the number of available condo units for sale from late winter/early spring into summer, but not this year. Inventory levels over past 5 months have been reflective of the first half of 2007, just as the glut of new construction and conversion units started to hit the market. 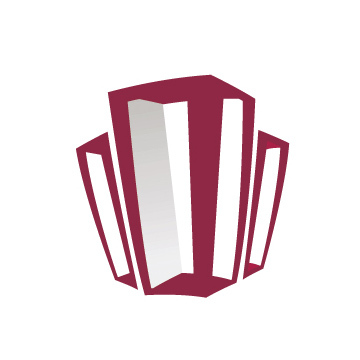 The low inventory level, combined with a healthy sales volume, is keeping the inventory supply rate down. 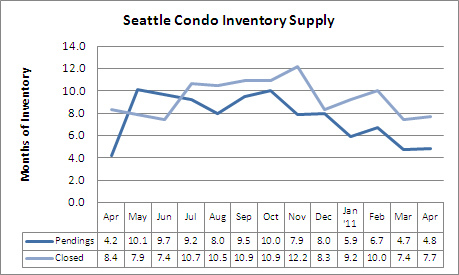 At 4.8 months of inventory based on pending sales Seattle’s condo market exhibited normal conditions for the second month in a row. 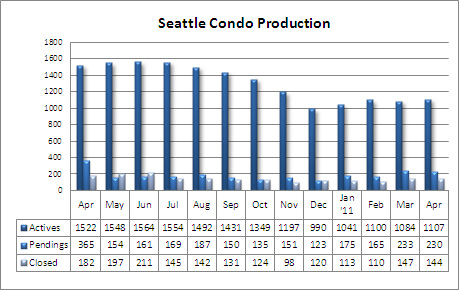 Based on closed sales, we have 7.7 months of inventory, which would indicate a normal-to-buyer market conditions. With mortgage interest rates remaining low, inventory levels plateauing and a better economic outlook, we should continue to see stable unit sales activity through summer. Anecdotally, we are experiencing a more active market, predominately among first-time homebuyers and those looking for an in-city second home. Our buyers have encountered more instances of competing offers than we’ve seen in quite a while. So from our experience, in terms of activity level (not values), the market appears to be rebounding. Condo values, on the other hand, probably won’t recover for some time with foreclosures and short sales keeping prices down. But, that’s not necessarily a bad thing, particularly if you’re a buyer. Wow! Great detail on the various statistics and analytics. I’m impressed with the depth of information you present here. I also think it’s important that you emphasize all sides of the issue and really present the benefits to everyone-not just you as an agent or to the seller, but the buyer as well. 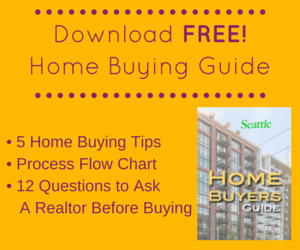 If prices are down, then you definitely may have more buyers on your hands ready to find the home-or condo-of their dreams! Perfect fit!